During the German occupation of France in World War II, gasoline was scarce, expensive, and often unavailable. Several companies offered systems for a vehicle to be powered by alternative fuels such as wood, coal, or charcoal. 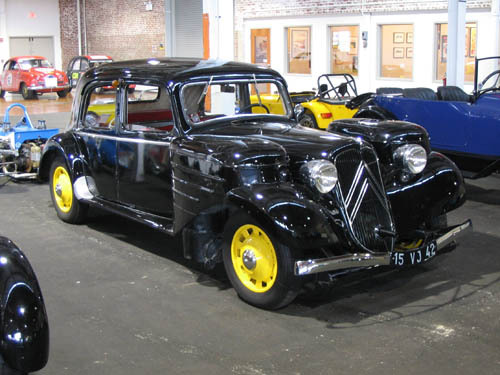 This car has been converted by Fap Elgazo Tarbes to run on coal. Adaptions were necessary to alter the vehicle from gas power to coal burner. The two large cylindrical containers under the front fenders are filled with coal and ignited. In about 30 minutes, enough methane gas would rise out the tops of the containers to feed the special carburetor, making the car run. Using the coal system reduced horsepower by one-third which reduced the top speed to about 45 mph (depending on how well the coal was burning). Range was about 30 miles before you had to stop and add more coal. Only a few of these conversions survive.